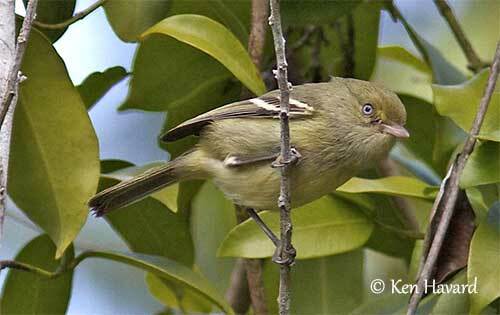 The Jamaican Vireo builds an open cup in bush or tree fork. The courtship behaviour is currently unknown. This species is sedentary in Jamaica and only performs short distances. The flight is agile with rapid wingbeats. The breeding season takes place from April to June. The Jamaican Vireo builds a hanging cup supported by the rim in the crotch of a horizontal fork in tree or bush. The nest is made with fern leaves, moss and bromeliad stalks. It is camouflaged with lichens. The female lays 2-3 white eggs with dark spots and blotches around the broader end. The young fledge in June. The Jamaican Vireo has restricted range in which it is common and widespread. In spite of intense forest clearance, it appears to be able to adapt to modified habitats, and can be seen foraging in coffee plantations. However, agricultural and residential development is suspected to reduce habitat availability and may involve some decline of the population. The Jamaican Vireo is not globally threatened and currently evaluated as Least Concern. The Jamaican Vireo is endemic to Jamaica where it frequents a variety of forests and wooded areas. It feeds mainly on insects, but also consumes fruits, depending on the season. It nests in an open cup placed in bush or tree fork. The Jamaican Vireo is common and widespread in suitable habitat at all elevations. The species is not globally threatened. The Jamaican Vireo is a medium-sized vireo with dull plumage overall contrasting with two pale wingbars. The upperparts are dull greyish-green with slightly brighter rump. On the upperwings, the flight-feathers are dark brownish-grey with greenish-yellow edges to outer webs. Greater and median wing-coverts are dark brownish-grey with pale whitish broad edges, forming two conspicuous wingbars visible on closed wings. On the uppertail, the rectrices are greyish with indistinct greenish edges on outer webs of lateral feathers. On the underparts, chin and throat are whitish. The breast is mostly yellowish-grey but darker on the sides. The belly shows the same colour but brighter. On the head, the crown is dull greyish-green with pale yellow-olive supercilium and supraloral area. The stout, slightly hooked bill is pale grey, with pale pink lower mandible. The eyes are pale blue-grey to white. Legs and feet are grey. Male and female are similar. The juvenile has dark eyes and the head is greyer. On the underparts, the yellow is reduced to a narrow central stripe. The Jamaican Vireo is found only in Jamaica. The Jamaican Vireo frequents a variety of forest types, from humid to semi-arid, also forest edges and thickets, especially in arid lowlands. It is usually absent from mangroves, marshes and cultivated woodlands. 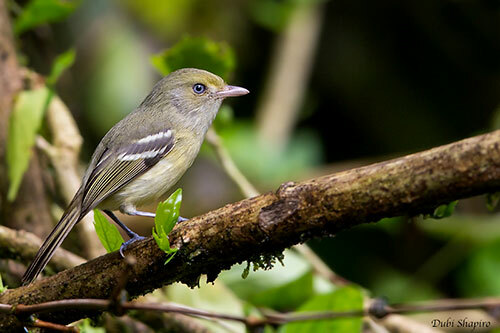 The Jamaican Vireo gives a repeated phrase for several minutes, a rapid, high-pitched “sewi-sewi” before changing to a new phrase such as “twee-weet-wuu” or “pee-eu”. The phrases may vary from slow series to fast trills, or can include both types. The Jamaican Vireo feeds primarily on small insects (86%) and to a lesser extent on fruits (14%) depending on the season. Insects are mainly caught during the wet season. It forages in thick vegetation and at all heights. It gleans prey items from leaves and occasionally from twigs. But insects are also captured by hawking in mid-air.